Hawaii Kai is one of O'ahu's premier residential neighborhoods. Located 10 miles from downtown Honolulu, this upscale neighborhood offers fine dining restaurants, shopping, a movie theatre cineplex, water sports, skating parks, and a canoe halau. 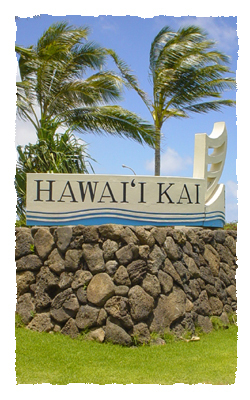 A brief history: Hawaii Kai is a planned community developed by Henry J. Kaiser and Kaiser-Aetna. Hawaii Kai was established by dredging and filling Kuapā Pond in the 1950s. Kuapā Pond originally covered 523 acres, with a natural barrier beach separating it from Maunalua Bay and the Pacific Ocean. Early Hawaiians used this ancient lagoon and wetlands as a fishpond. Hawaii State Civil Defense website. ► Visit "Hawaii Kai Strong," whose mission is to make Hawaii Kai tsunami-ready and storm-ready. Meetings: The Neighborhood Board usually meets on the last Tuesday of the month at 7 pm at the Hahaione Elementary School Cafeteria. TV: Watch Olelo Channel 54 on the 2nd and 4th Monday evenings at 9 pm for broadcasts of the meetings. Check the Olelo.org programming schedule. Beginning October 29, 2007, refuse is collected on Wednesdays and recyclables and green waste are collected on alternating Saturdays. Bins should be placed at the curb by 6 am on collection days. Bulky item pickup is conducted on the 4th Wednesday of every month, taking place over a 3-4 day period. ALL ITEMS must be placed at the curb by 6 am on the 4th Wednesday of the month. Sewer: Hawaii American Water Co.
** Provides wastewater service to consumers in Hawaii Kai. Rates are established by the Hawaii Public Utilities Commission.